We take pride in providing American-made, certified products that meet our industry standards. (FSC ® C003233) chain-of-custody designations. And, Mullican was the first American hardwood flooring manufacturer in the industry to produce a FSC®-certified, solid domestic floor. FSC® is the world’s oldest and most viable organization devoted to environmentally friendly forestry, and we have brought more than 30 FSC ® products to the market—including engineered and exotic floor selections, in addition to solid domestic selections. All of these products carry the FSC® logo, which means that all entities in Mullican’s supply chain for these products, from the Appalachian forestlands where we harvest our raw material to our distributors, also hold FSC ® certification credentials and meet FSC ® standards. Mullican’s FSC ® products can be used by builders and architects for LEED projects, which require 50 percent of their wood-based materials be FSC ®-certified. LEED certification is a rating system established by the  U.S. Green Building Council for assessing environmentally sustainable construction. Through this system, builders can acquire credits or points on projects if specific “green” standards are met, such as the use of FSC ® wood products. For more information on the FSC ® and the certification process, visit ​www.fsc.org or www.usgbc.org. In 2007, the U.S. Forest Service released data for the Appalachian Mountains—the source of Mullican’s raw timber—which indicates that an average of 2.29 new trees were growing for every one that dies or is harvested. 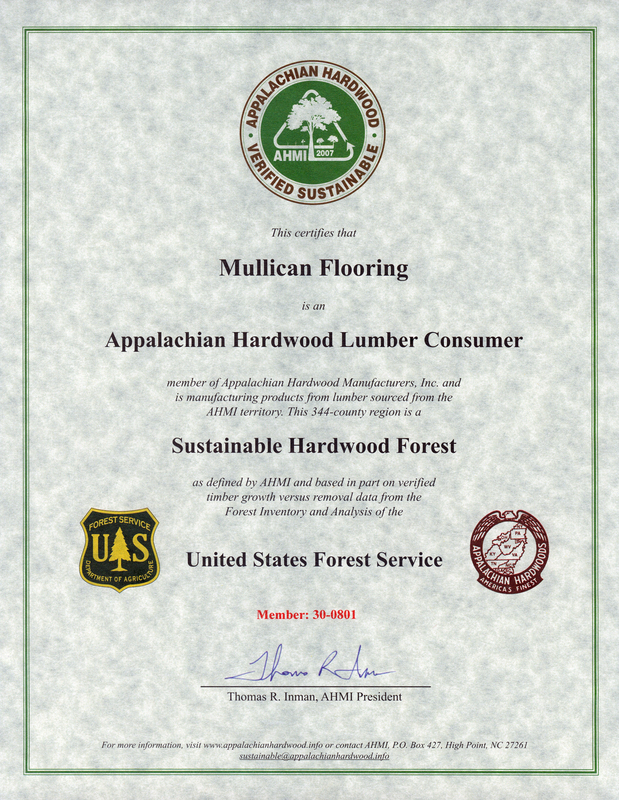 As a result, Mullican Flooring has earned the right to place an Appalachian Hardwood Manufacturers, Inc. (AHMI) verified sustainable logo on all of our prefinished domestic products. Notably, Mullican was the industry’s first domestic hardwood producer to promote AHMI Verified Sustainable Appalachian timber. For more information on the AHMI Verified Sustainable program, visit www.appalachianhardwood.info. Mullican Flooring’s engineered and solid products are California Air Resource Board (CARB) compliant. CARB standards cap hardwood plywood’s formaldehyde emissions at 0.05 parts per million (ppm). Mullican Flooring is approved by the California Air Resources Board (CARB) to be an ultra-low-emitting formaldehyde resin (ULEF) manufacturer of composite wood products destined for sale, supply or use in California. As an industry leader, we partnered with the National Wood Flooring Association (NWFA) to develop the Responsible Procurement Program for hardwoods (RPP). Mullican Flooring and the NWFA recognize the need to assure consumers that a flooring product is produced with care and concern for the environment. RPP has helped to provide this assurance by introducing the "U.S. Renewing Forests" label into the marketplace. This label delivers a clear, two-fold message: 1) Hardwood growth exceeds loss and removal from our hardwood forests at the state level, based upon U.S. Forest Service data; and 2) Timber, logs and wood were not harvested from controversial sources, such as illegally logged or highly valued conservation areas, to produce this product. The U.S. Renewing Forests label solidifies the industry's position in domestic markets and better positions the industry in the global marketplace. FloorScore® is the most recognized indoor air quality (IAQ) certification standard for hard surface flooring materials, adhesives, and underlayments. Developed by SCS with the Resilient Floor Covering Institute (RFCI), a leading industry trade association of flooring manufacturers and suppliers, it qualifies for many green building schemes including LEED v4, WELL, BREEAM, and CHPS. All of our prefinished products meet the FloorScore® certifcation. Mullican Flooring fully supports the 2008 amendment to the Lacey Act, which controls the illegal importation of harvested timber into the United States. Any wood that has been harvested or transported in violation of a law or regulation of the country in which it was sourced is considered to be illegal timber. U.S.-based buyers of foreign wood can be prosecuted even if they have no knowledge that their timber was illegally sourced, and can face prison terms or fines up to $250,000 for each violation. Achieving certifications through such organizations as the FSC or RPP of the National Wood Flooring Association is one way flooring manufacturers can safeguard their companies against inadvertent violations. For more information, review the World Wildlife policy. Mullican Flooring is dedicated to creating the highest-quality hardwood flooring in the world through environmentally sound manufacturing practices. We strongly support the elimination of all forms of forced and compulsory labor, child exploitation, slavery, and human trafficking. Mullican Flooring and its employees are expected to follow applicable laws, rules, and regulations in effect in the countries and jurisdictions in which the company does business. In addition, employees are to conduct business in an ethical manner. The company requires its suppliers, vendors, and contractors to do the same. Mullican Flooring depends on its suppliers to ensure they are following applicable laws. Mullican Flooring occasionally conducts audits and verifications within the supply chain to ensure compliance with applicable laws, rules and regulations, and ethical conduct. Mullican Flooring generally does not hire third parties to conduct audits or verifications for such purposes. In addition, Mullican Flooring encourages its suppliers to carry the Programme for the Endorsement of Forest Certification (PEFC), which, among other standards, requires adherence to the protection of workers’ rights and welfare, and safeguarding the basic rights of workers. PEFC also requires certified members to recognize the principle of free, prior, and informed consent (FPIC), the UN Declaration on Indigenous Peoples’ Rights, and ILO Convention 169 on Indigenous and Tribal Peoples.